Very modern (too modern for a BR transition modeller like me), but still very cool! I've dealt with Southgrove's High Street, the town's inner area, and now dealing with suburbia. Three stores and two 1930s semis planned. 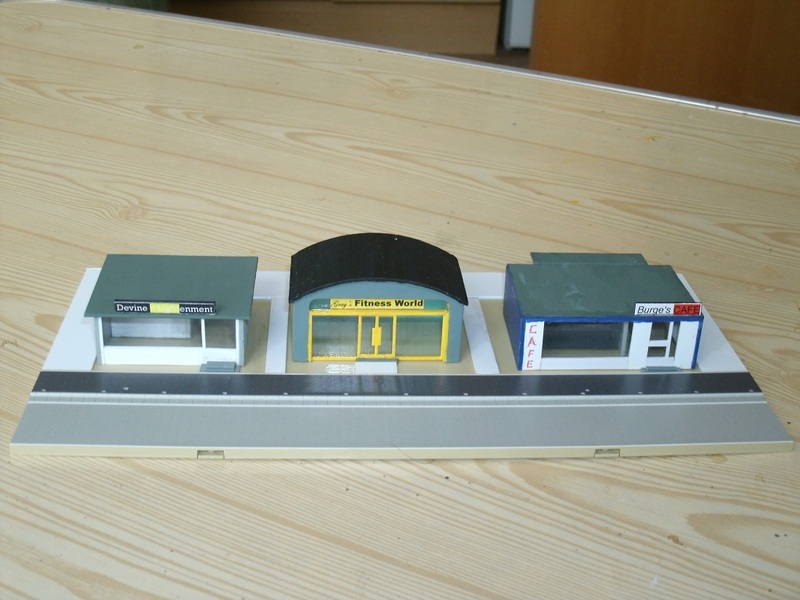 After some revision, I'll model Devine 'N'lightenment store, Gray's Fitness World (the arc-roofed structure - yet to be modified) and Burge's Café. 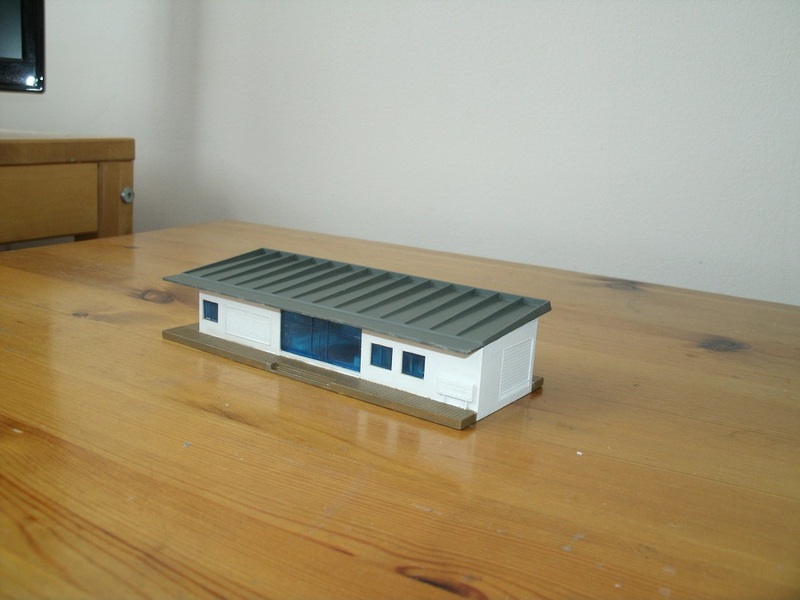 Gray's Fitness World will be based on a model of unknown toy-like origin, initially bought at an exhibition in Bradford which looked about the right size in N and gives an interesting variation to this mini strip mall. All three ex-pupils lived along the same short stretch of road and I've placed the named structures in the same order where they lived. 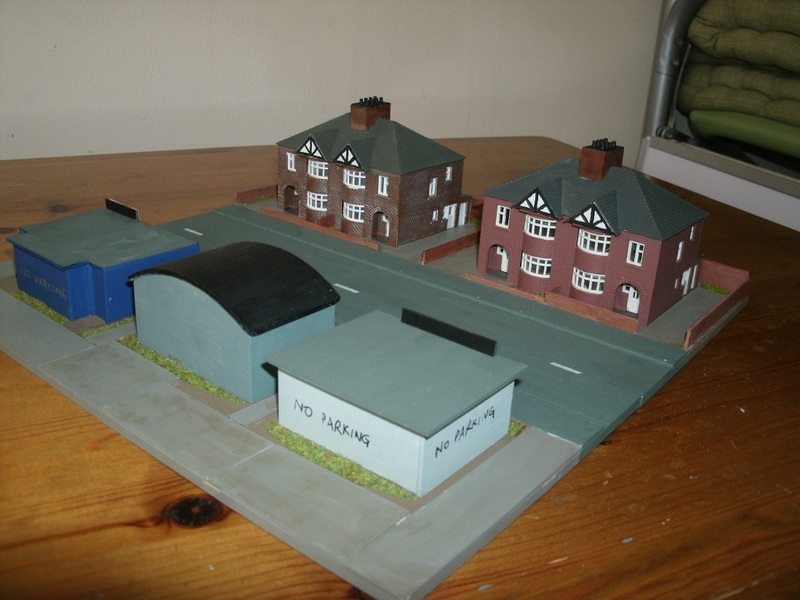 Off the diorama, two outbuildings are present - one Kestrel (in bits) and the other a toy-like structure of unknown origin bought at the same time as the arc-roofed structure in Bradford. Today was my birthday and mum and I went to York on the Coastliner bus. She and I did some shopping and after lunch went our own ways. 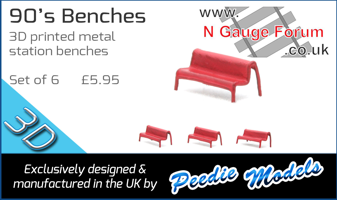 I called into Monk Bar Models and bought Ratio GWR spear fencing and oil tank kits, and Kestrel's laser-cut wooden garden fencing, however, wasn't tempted to buy any rolling stock. I didn't spend long at the NRM but looked in the heavily-modified LSWR dining car displayed in the Great Hall as part of the history of WW1 ambulance trains. I remembered two similar LSWR dining car saloons stored on the Mid-Hants railway at Ropley until they were sold and moved to the Pontypool & Blaenavon Railway. After visiting the NRM, I returned along the route via the station in order to catch my bus home. 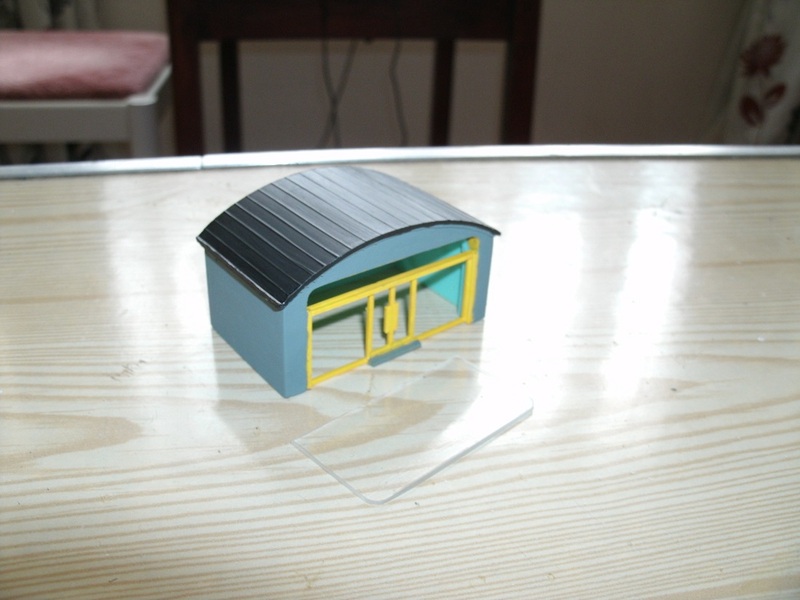 work's progressing on Gray's Fitness World store ... the exterior walls are appropriately painted grey with bright yellow door and window frames added - until about late 1980, the ex-pupil's home in question had bright yellow exterior woodwork!! 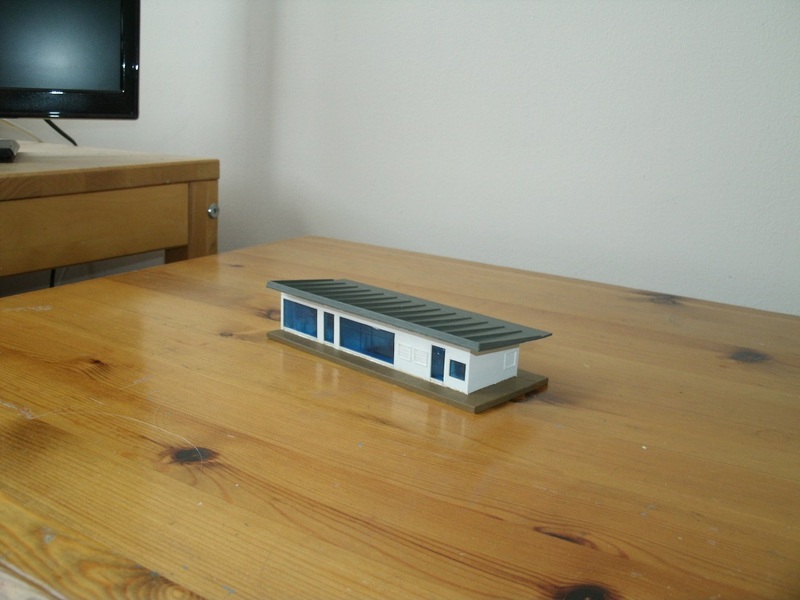 I'll also print out a lot of customised names for various buildings and industries. Devine 'n'Lightenment, Gray's Fitness World and Burge's Café, including service access road and paths. The "nlight" part of the sign in "Devine 'n'Lightenment" isn't too clear in the photo as it was printed in white lettering on yellow. I'm not including too much interior detail although one can make out the office in Devine's store and the counter and eating area in Burge's Café. Although the "suburbia" section's not finished, I've made sufficient progress to see how that blends in with the rest of my painted modules. In particular, the semis still need a lot more work - painting and grassing over the front and rear gardens, walls, fencing, chimneys. 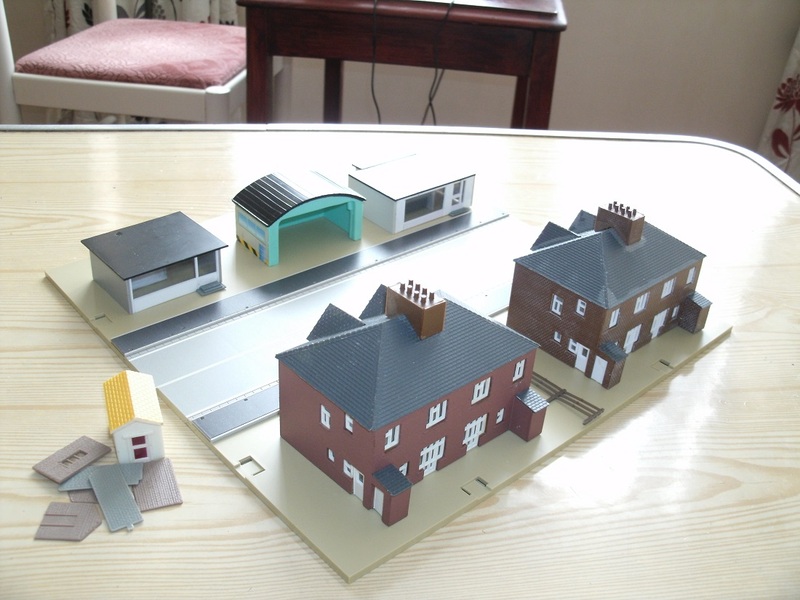 I spent ages going through my stocks of fencing to place round the houses, but decided to scratchbuild everything from styrene sheet and strip. Nice job on the stores and like the graffiti on the Devine store..
Work's now completed - to a basic level - on my suburbia scene. 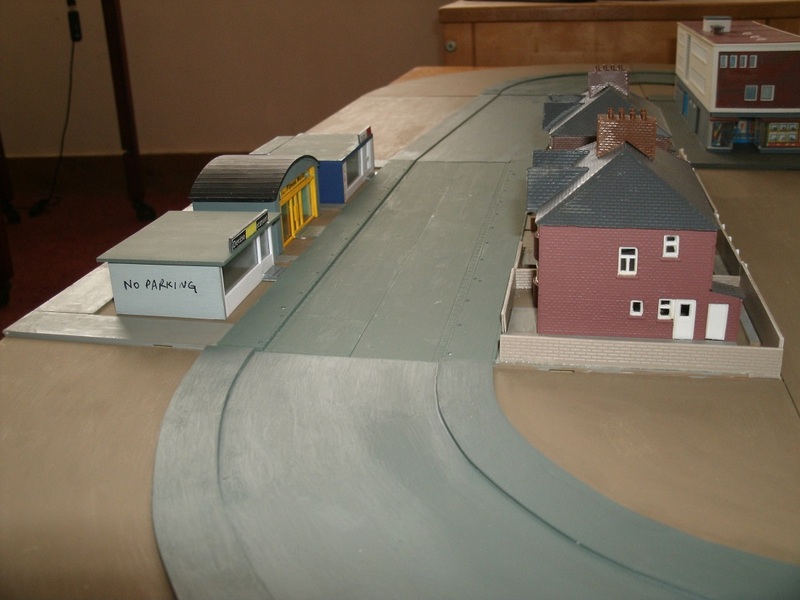 I could have added extra details including garages, gates and sheds to my semis and/or made the backs and alleyways of the stores look more unkempt, however these all add more fragility especially when having operating sessions and then putting them away. 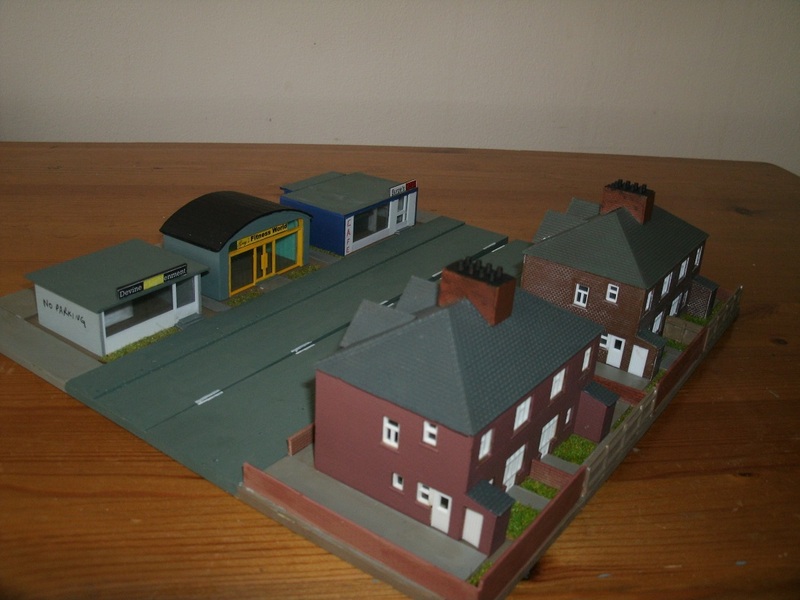 Work's progressing on the bus depot. 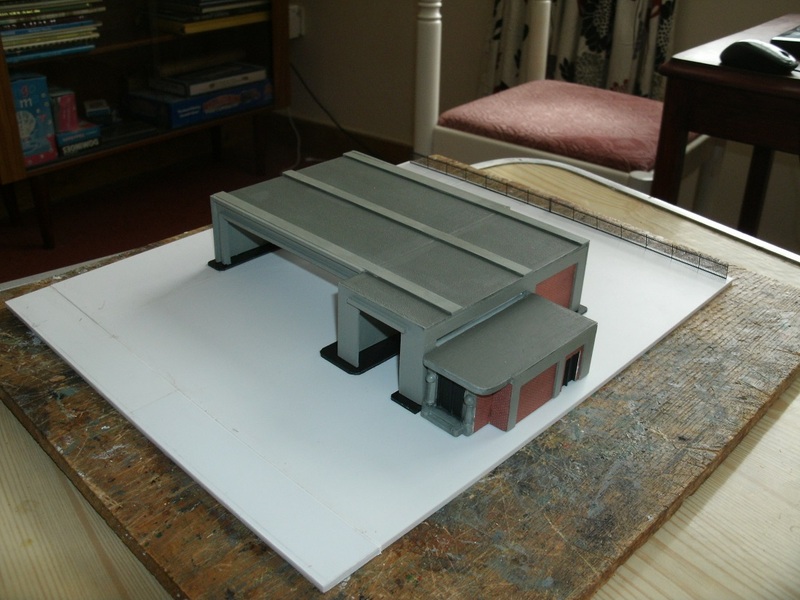 It's scratchbuilt in styrene based on a freelance design involving concrete, with brick infills by Metcalfe Models. I enlarged the base in order to conform with the dimensions of the housing module called "Brancherry Close". 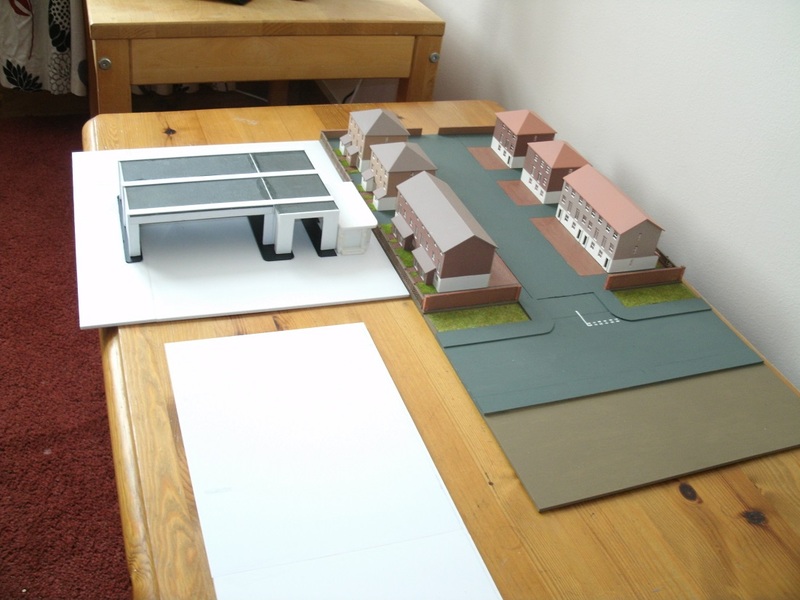 In my imagination the housing development was built on the former bus depot. It means the module becomes a direct swap. 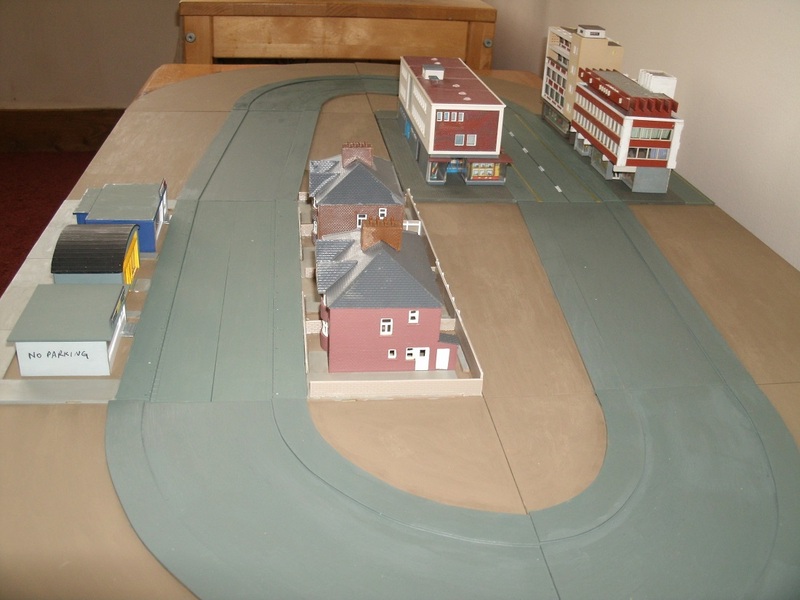 I'm prioritising several long-term stored projects from my earlier layout, Fisherlea, for completion. Camilleri's Ristorante is a repainted old Lima plastic Italian modernist station building which will be adapted as an upmarket restaurant. 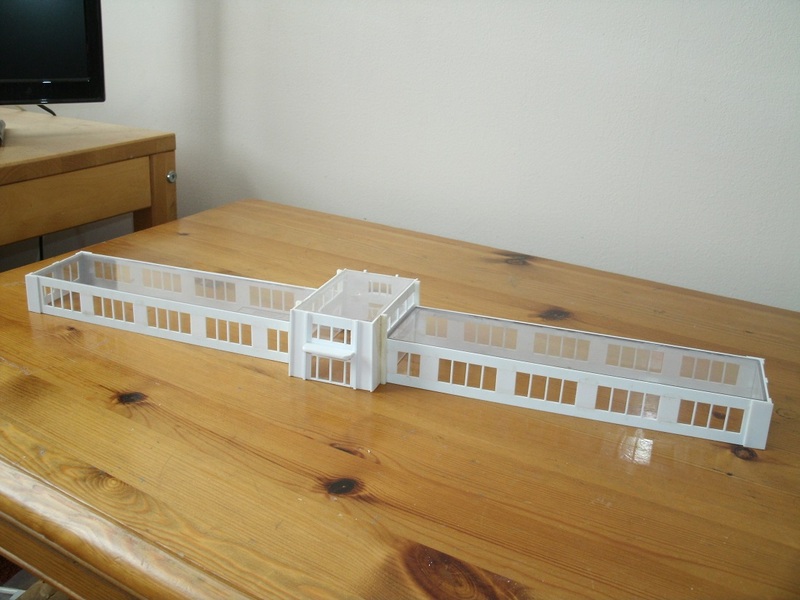 The art deco-style office would have been the centrepiece of Fisherlea. Its initial use was an HQ of a US-based multinational when it wanted to make its presence known in Britain. Its new purpose will now be the Goodall-Hillyer (known colloquially as Goodhill) Athletics and Social Club's HQ. Hi really enjoyed catching up with this thread, hadn't heard of the Kato modules before. I like your approach to office building, it captures the feel a building from the 30s to the 60s with the Crittal metal window frame style. Some really good scratchbuilding there. I like the re-use of materials like the clear boxes.